This 100 % cotton denim 8.3 oz fabric has been woven with a crosshatched texture and a color contrast. This apron is sized 31 inches in width and 31 inches in length. 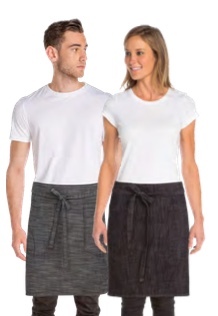 This sturdy apron has 2 hip pockets with saddle stitching designed to hold an IPad2 or similar sized tablet. 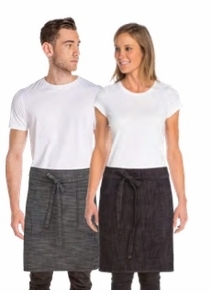 This apron is functional and perfect for the new urban chic style of today's modern uniform trends and hip restaurant scene.